Nature’s Pond Conditioner by Koenders is a two in one bottle product. First, you have a bacteria that will, over time, turn the black muck in your pond into clean water, helping to lower the fertility levels in the pond. 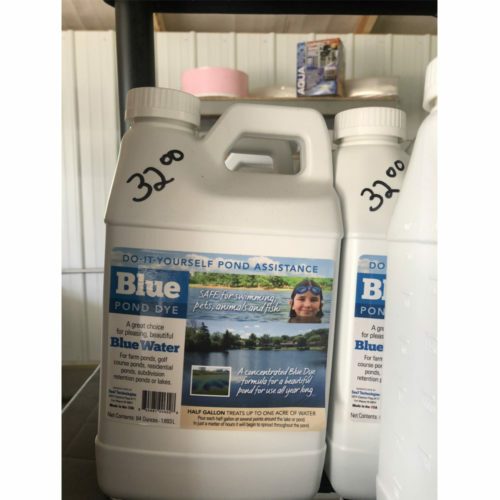 Secondly, there is a food grade dye in it as well, that will give your pond a natural green color to help block out sunlight and slow the growth of unwanted plant life. One gallon container. Shipping and handling is calculated in the cart. 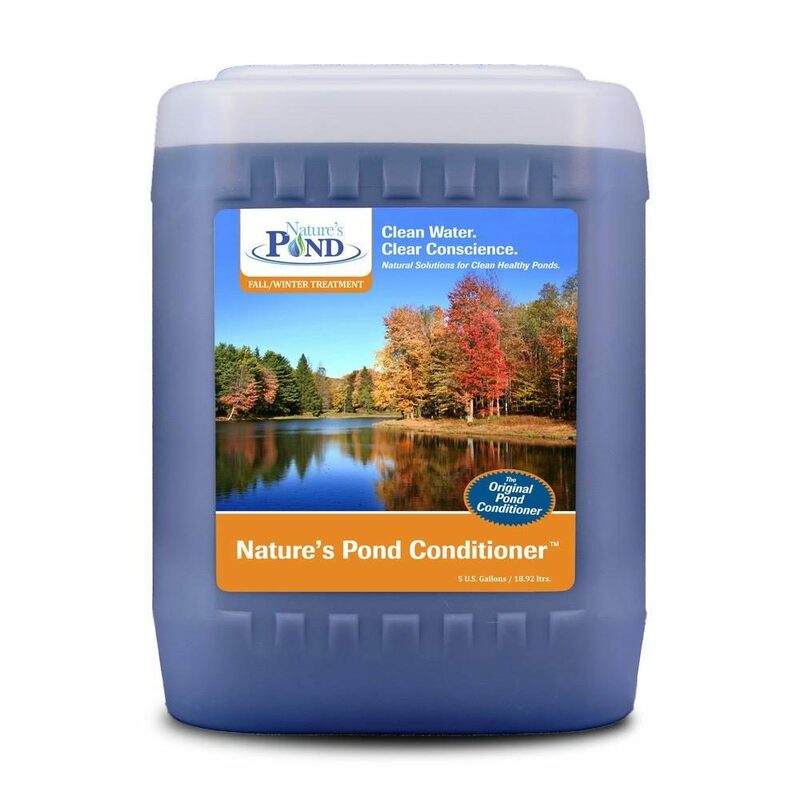 Nature’s Pond Conditioner by Koenders is a two in one bottle product. First, you have a bacteria that will, over time, turn the black muck in your pond into clean water, helping to lower the fertility levels in the pond. 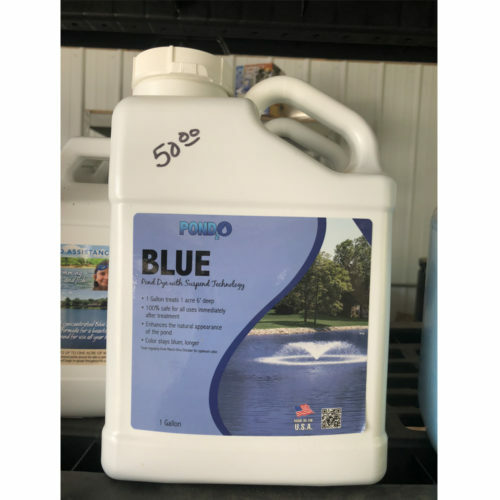 Secondly, there is a food grade dye in it as well, that will give your pond a natural green color to help block out sunlight and slow the growth of unwanted plant life. You want to treat your pond like a septic tank, because that is what it is – nature’s septic tank. You have fish manure, dead fish, duck and goose manure, vegetation growing and dying, tree leaves, pretty much anything organic – this is the black muck on the bottom of your pond. 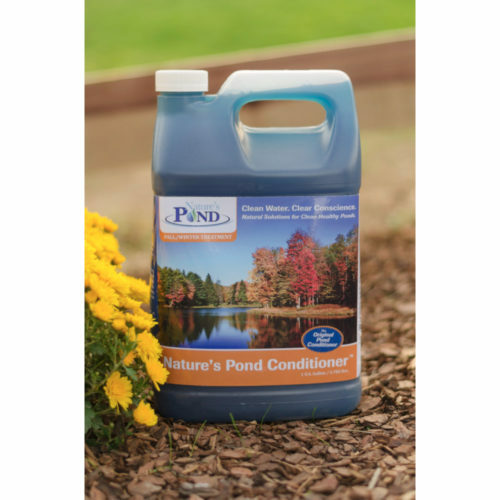 By using Nature’s Pond Conditioner, you introduce bacteria to the water that go down to the bottom of the pond, break the solid waste up, and turn it back into clean water. This is good preventative care for your pond because the black muck makes fertility that makes your vegetation grow much quicker. New ponds grow vegetation, but old ponds grow it even more because of the black muck in the pond, so if you have a new pond, it is better to start this now before you get a huge buildup of muck in your pond. When your fertility rates increase, you grow problem vegetation like duckweed and water meal, and algae blooms that cause fish kills. By using Natures Pond Conditioner, you prevent the black muck from causing high fertility rates and growing vegetation, and prevent fish kills while keeping your pond healthy. You can use this almost any time throughout the year. 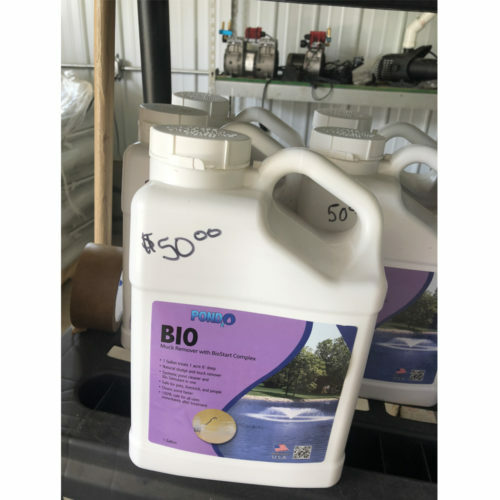 This is one of the few on the market that you can use almost any time, because the bacteria are specially formulated to survive in waters as low as 40 degrees – Ohio ponds rarely get colder than that in the bottom of the ponds, even in our most freezing winters. This allows you to be proactive year round. This bacteria will also work up to 4-5 months before it needs reapplied, making it unique to the competition which requires much more use, and cannot be used in colder waters, resulting in less protection and more money spent over time. We recommend brand new ponds to use 1 gallon per acre per year, and for ponds with heavy concentration of duckweed, water meal and algae blooms, you should use a gallon per quarter acre, 1-2 times a year. When you use bottom aeration with Nature’s Pond Conditioner, you supply the bacteria with oxygen, making them more active and more effective.